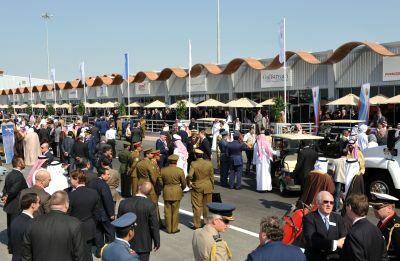 Following initial scepticism the inaugural Bahrain International Airshow, held at the Sakhir air base, has proved to be a resounding success for the aviation industry as a whole and for the Kingdom of Bahrain. The show was organised by Farnborough International Ltd. The site adjoins Bahrain’s Grand Prix racetrack the 3.36 mile circuit currently being extended to four miles in time for the opening race of the F1 season on Sunday 14 March. The aerospace event hosted 40 participating companies, 94 aircraft and visiting delegations from 25 countries. Early indications suggest that deals worth somewhere in the region of US$1bn were signed at the event with the attending companies from all over the world and 30,000 visiting the public and trade areas over the three days. Amongst the major deals announced at the show were Yemenia’s (Yemen’s national carrier) for ten Airbus A320s, as reported in AERBT last week; Bahrain’s purchase of nine Blackhawk-M helicopters from US manufacturer, Sikorsky; Gulf Air’s preliminary agreement to lease two Embraer 170 jets; Selex’s award of US$15m contract by the Bahrain Civil Aviation Authority for a primary surveillance radar and two Mode-S secondary surveillance radars at Bahrain International Airport. Boeing’s announced that it expects to deliver 1,700 aircraft in the next 20 years to the Middle East whilst on the Airbus front the huge hangar certainly helped found rumours of a Bahrain order for a pair of VIP Airbus A380. Switzerland-based Comlux Aviation Group and Saudi-based Maz Aviation reached a partnership agreement to set up a new Bahrain-based aircharter service. Comlux and MAZ will base two of their Airbus aircraft, an A318 Elite and ACJ, in the region as a first phase, and by the end of this year an Airbus A320 Prestige will be added to the new company fleet when Comlux takes delivery on it. ''A presence in the Middle East is strategic to our VIP aircraft operations in Fly Comlux division. This joint initiative between MAZ and Comlux follows our agreement for Saudi charter sales and represents a new step for our development into the Middle East,'' President of Comlux Group, Richard Gaona said. Chairman of MAZ Aviation, Mohammed Al Zeer, said that the partnership was part of an effort to provide close support and services to their clients in the Middle East. The UK’s Aerospace Defence and Security organisation, A|D|S (formerly known as the SBAC), announced it has chosen Bahrain to act as the central hub for the Middle East. Gulf Aviation Academy, a wholly owned subsidiary of Bahrain Mumtalakat Holding Company, was launched and will play a key role in the development of Bahrain's air transport training and infrastructure.